Hebi is a sixteen year old who attends Kin Private Boys Academy. He has light brown hair and black eyes (...don't you dare say a thing, Kato-chan... ;P). His girlfriend is Densetsu Katori and eventhough they seem to argue every once and a while... they definately like one another. He is quicker to like his Knighthood than Raion... (because he wasn't the first... *grin*), so you won't hear him complain... much. Hebi says this to transform into Terra Knight. Raising his green and black henshin stick, shafts of energy shoot out and surround him, forming his fuku. Which is a forest green shirt, with black pants and shoes, green choker and headpiece. This is Terra Knight's only attack. A dark green ball forms in his hand, throwing it to the ground, it makes the ground shake, shocking the target frozen. 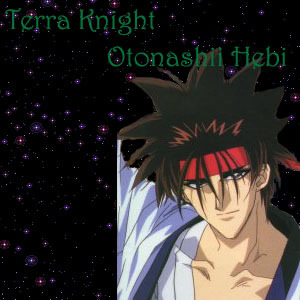 Hebi OR Terra Knight says this to transform into Silver Terra Knight. Same transformation as before, but his choker and headpiece have a golden pendant of his sign. This is Silver Terra Knight's only attack. He glows with a dark green aura, which makes the ground shake harder than in Ground Shock, hard enough to knock people off their feet. Hebi OR Silver Terra Knight says this to transform into Golden Terra Knight. Same transformation as before, but a jeweled dagger is weilded into his hand. This is Golden Terra Knight's defensive attack. Rocks break free of their captive earth, and fly at the target, knocking them off their feet and smashing them to the ground. This is Golden Terra Knight's offensive attack. Deadly as it might seem, the earth cracks below the target and boiling lava cooks them to a crisp. With the Sailor and Greek Senshi however, it heals any wounds, no harm from the lava.